Great story with very realistic action and events. I appreciated the name dropping of the items he would use. Very easy to Google search it and visualize exactly what the character was doing. I almost quit this one. The exhaustive name dropping and acronyms of survival gear, guns, food, packs, etc. coupled with the exhaustive detail / description of every move was, well, frankly boring. I stuck with it though and understood the why to all that in the beginning of the story as the story unfolded. Then. I was hooked. Thrilling story very well told. Just started the next one in the series and will listen to them all. A. American is a fantastic writer. Highly recommend. I truest hope what happens in this book NEVER become reality. This is a start of an amazing series I never wanted to end!!! This is a book (and all after) that will touch your soul and ask you the question- “are you ready?” I could not stop listening- and purchased every book!!!! The flood of profanity surprised me. This book was an excellent read. Just the right amount of detail. I like the way the author laid out the plot and the language did not get too technical. great read. Solid storyline. Very good narration. Went fast, I guess that's a good thing. This was worth reading. It has a good story line with a lot of information on survival. It sure makes you wonder. 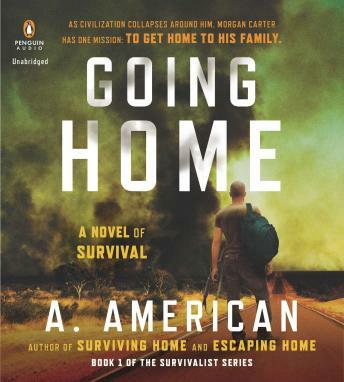 Excellent survival story that really captures what could happen in the very near future. As a prepper myself I found this entertaining and informative. Poorly written in some ways, way to many acronyms, very hard to understand what the Author is talking about if you don't know what all of the acronyms stand for. I found this quite irritating.